Like the gut-shot of grief that tells you you're still alive, the first patch for the PC version of Max Payne 3 is coming tonight. 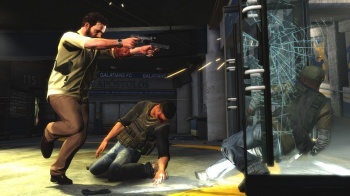 Max Payne 3 finally showed up on the PC a couple days ago and while things have gone reasonably smoothly for most people, there are still a few "commonly reported issues" kicking around that need taking care of. Fortunately, Rockstar is on the job and expects to have the first in a planned series of patches for the game rolled out tonight. -Fixed reported issues of audio dropouts when no audio device was plugged in, or when the headphones/speakers disconnected while in game. -Fixed reported issues of mouse being sluggish, especially in prone and Shootdodge. Increased top end range of mouse sensitivity, but kept the slider from 1-10, allowing the user more range in their sensitivity setting. -Fixed reported issues of mouse acceleration affecting aiming, included commandline option to disable mouse acceleration, -nomouseaccel (In a future update, this will be added as an option in the Mouse Controls menu). Fixed reported issues of game locked in incorrect aspect ratio, or alt-entering and having incorrect aspect ratio. Added commandline option for locked aspect ratio as commandline option -aspectratio width:height Â (ie. -aspectratio 4:3 / -aspectratio 16:9) In a future update, this will be added as an option in the Graphics menu. Fixed reported issues of the video card reporting having 0MB of video memory available. Â Users unable to adjust Graphics options because of this (Also helps fix stuttering on some video cards). Rockstar also said it is aware of "cheaters and hackers" in the game's multiplayer mode, and that it has plans to deal with those unscrupulous shenanigans in another patch. More information about the upcoming update can be found at the official Max Payne 3 website, while help with other issues is available at Rockstar's support site.